Joe Cory is a visual artist and an Associate Professor in the Department of Art and Design. 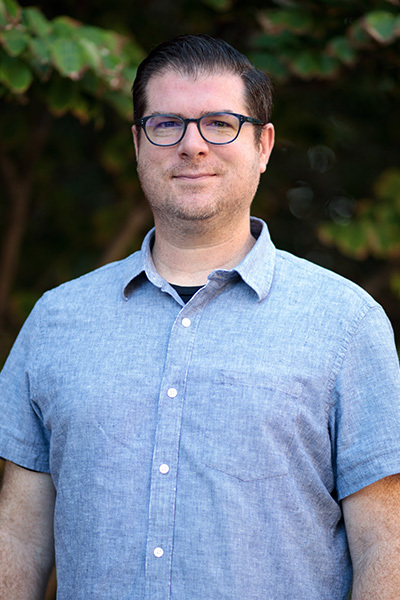 He also serves as the Director of the School of the Arts new Catalyst Program, and as a Faculty Fellow in Samford's Center for the Worship and the Arts. Using fragmented imagery, he creates paintings, collages, and digital artworks to help him navigate the complex world in which we live. Cory is especially interested in using his work to serve as a reminder of God’s grace amidst a broken world. He exhibits his artwork across the United States and has won numerous grants and awards. He is an Elder at Shades Valley Community Church in West Homewood and serves on the Board of Directors for CIVA (Christian's in the Visual Arts) a national organization dedicated to hosting conversations about the intersection between art and faith. When he is not in the studio or classroom, Joe enjoys spending time with his wife of almost 20 years, playing games with his four children, reading, and watching sports.